Louisa Chatterley wears a white silk dress. The gauze over the train has blue scalloped edges. The extravagant head-dress is a feast of feathers and jewels. After a career at Drury Lane and the Haymarket, Louisa Chatterley appeared at Covent Garden for the first time on 6 November 1821, as Miss Hardcastle in “She Stoops to Conquer”. 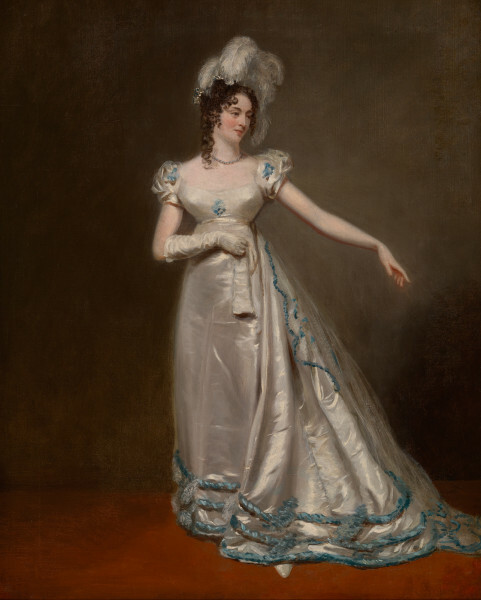 Davenport Adams suggests she played Lady Teazle at Covent Garden in 1822 (and this claim is borne out by G0112), but all the performances of the part that year (19 March, 19 and 26 April and 5 June) were given by Maria Davison. Louisa Chatterley played Lady Teazle at Covent Garden on 8 January 1823, but the part was given to Miss Chester thereafter. The costume would confirm a date for the picture in the early 1820s.